Machine Vision challenges are often solved by a judicious choice of lighting. Lighting is an essential component of the machine vision system. 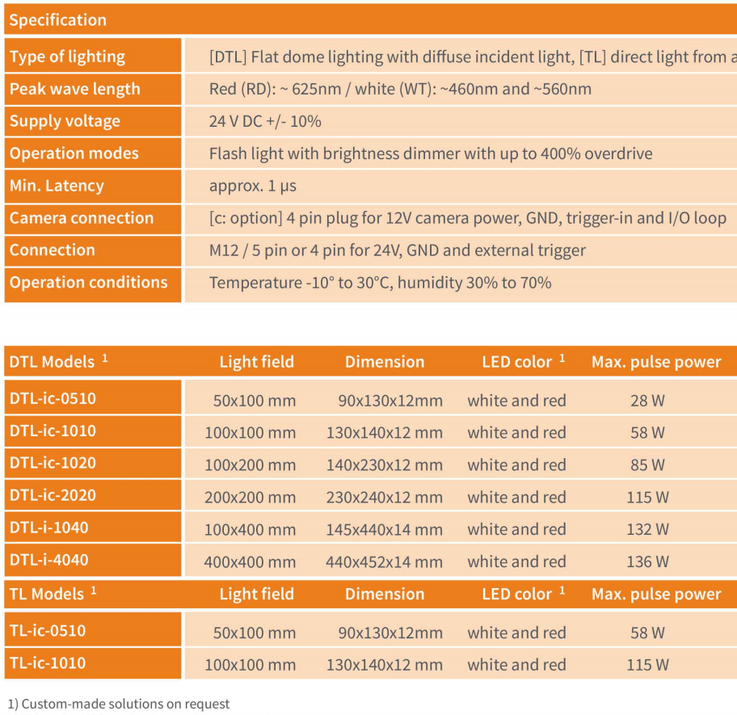 Below you will find information about our main machine vision lights, please do not hesitate to contact us if you have a specific need. All these models are available in white and red, as an option, most of them can also be supplied in green, blue or infrared. 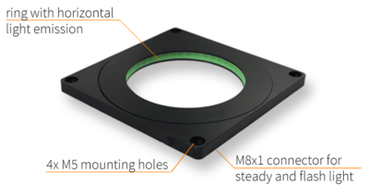 M8 connectors are available as well as many mounting accessories. We offer power supplies and pulse controllers as well as LED lighting incorporating the pulse controller. Equipped with one 24V input for continuous light and another direct LED input for flash light. 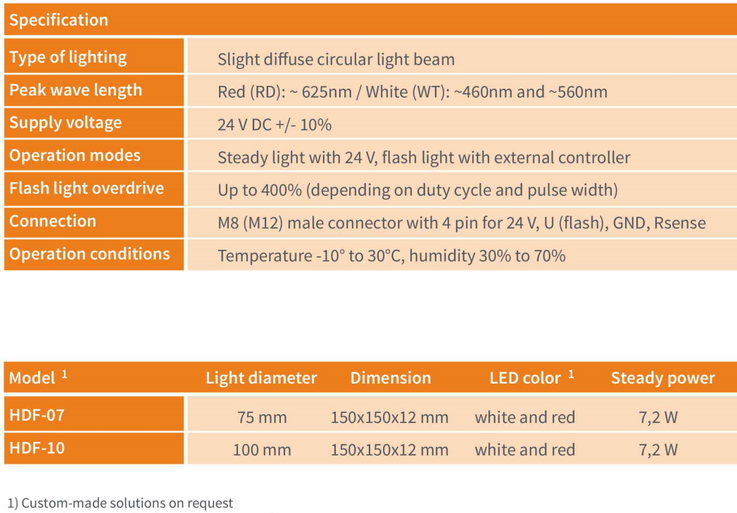 Common LED colors are white and red and optional blue and IR. Due to the very homogenuous light emission, this lighting - placed behind the object of inspection - is ideal for the inspection and measurement of contours. Beside the use as back and transmission lighting it can be used also as incident light for bright field applications. 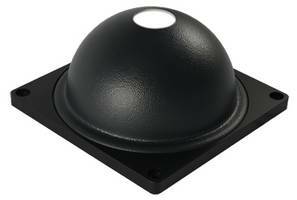 The flat dome lightings are ideal for the inspection of objects with a low reflective surfaces in bright field. Equipped with one 24V input for continuous light and another direct LED input for flash light. The common LED colors white and red and optional blue and IR, makes this lighing series very flexible. 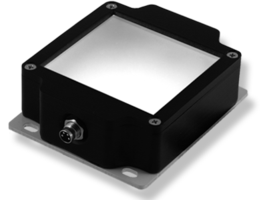 The optional camera brackets and mounting kits allows applications with very compact diffuse emitting LED flat dome light sensors. The object is illuminated indirectly by the LED light reflection on the inner dome resulting in an almost shadowfree illumination of the object. Thus it is ideal to inspect highly reflective surfaces such as printed foils or polished metallic objects. Equipped with one 24V input for continuous light and another input for flash light, it is available with the LED colors white and optional red. Dedicated camera brackets and mounting kits allows an easy installation. Bar lights can be used in various applications. It is easy to realize low angles of incidence for a dark field setup or various angles for a bright field application. Bar light can be used as well for simple line scan applications. 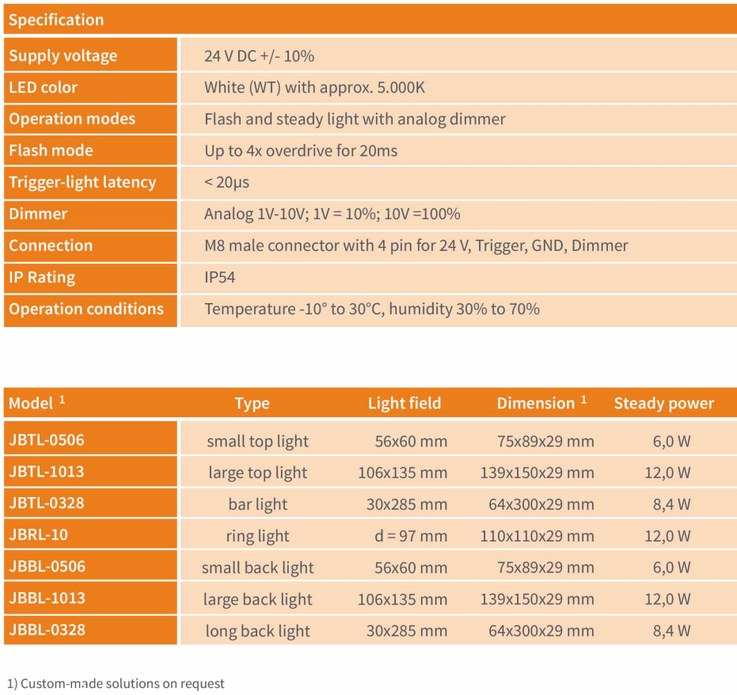 For steady light mode only 24 V DC is required. 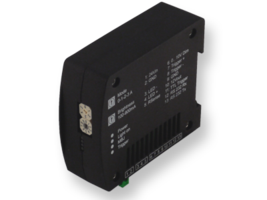 For flash applications an external controller like the CTR controller from MBJ is needed. 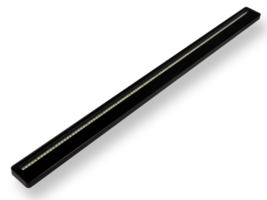 Bars are available with the the common LED colors white and red and on request with blue and infrared. 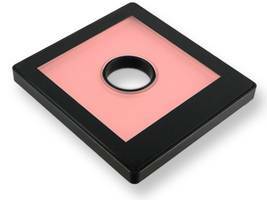 Ring light are standard illumination lightings for various applications. Mounted in front of a camera lens, compact inspection units are possible. The build-in current source is ready for steady light operation with 24 V DC. For a safe flash mode the MBJ CTR controllers with the Rsense technology are recommend. The object is illuminated by a circular light beam at the side. This horizontal ring light series is ideal to inspect objects in dark field such as materials with embossed or stamped surfaces. Equipped with one 24V input for continuous light and another input for flash light. 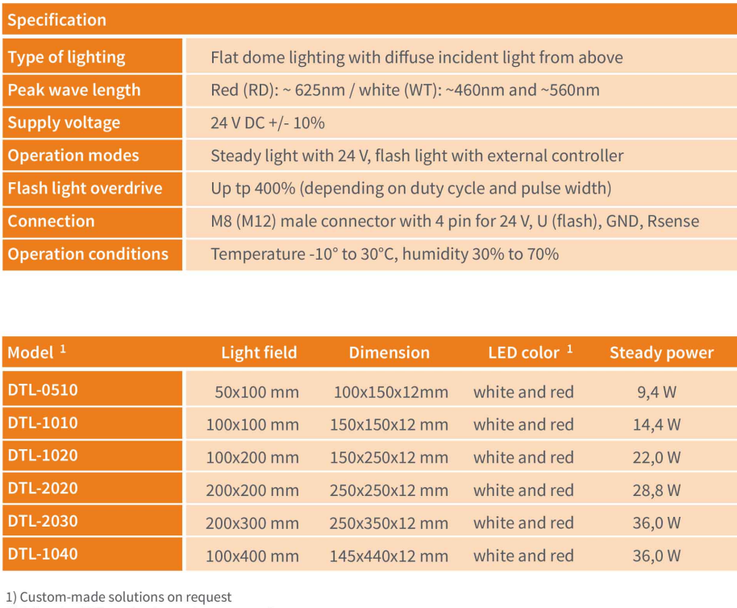 Availability of the LED colors white (standard), red, blue and IR, makes this lighting series very flexible. Dedicated camera brackets and mounting kits allows an easy installation. 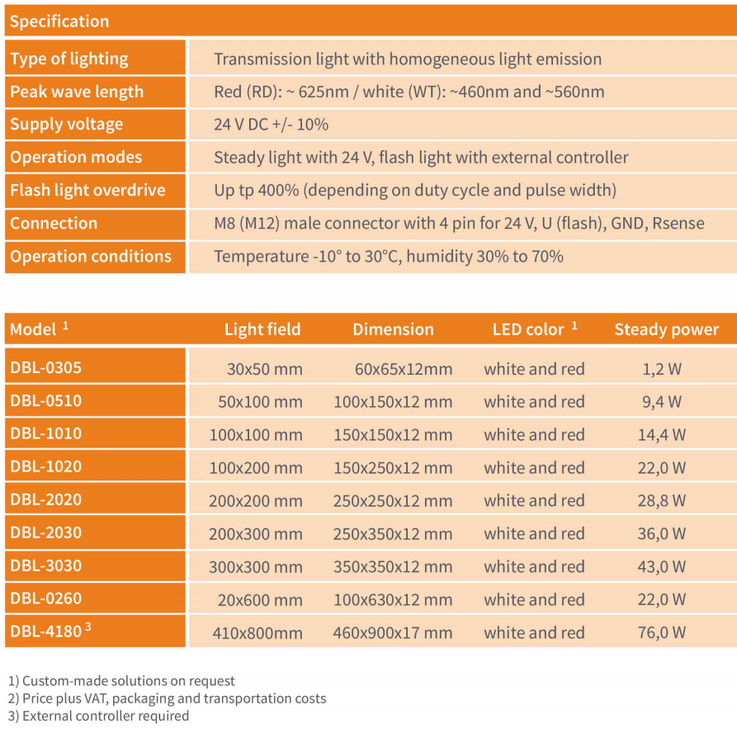 The JustBright illumination series is designed to lowest costs. The aluminium board is ground and cooling plate in one. The housing is made by 3D printing which allows great freedoms for custom-made designs. The new innovative LED controller allows flash and steady mode operation. For flash mode the light is automatically driven with up to 400% of the standard power. Using the 0-10 V interface the illumination is dimmable during steady light. The I/O are short current protected. To prevent overheating a thermo switch is build-in. These flat domes are already equiped with a flash cotroller. The 12V power supply enables a direct connection of a machine vision camera. Thus the module is lightning in sync to the image aquisition. Beside the 24V power a trigger input can be used for direct control by an external sensor. 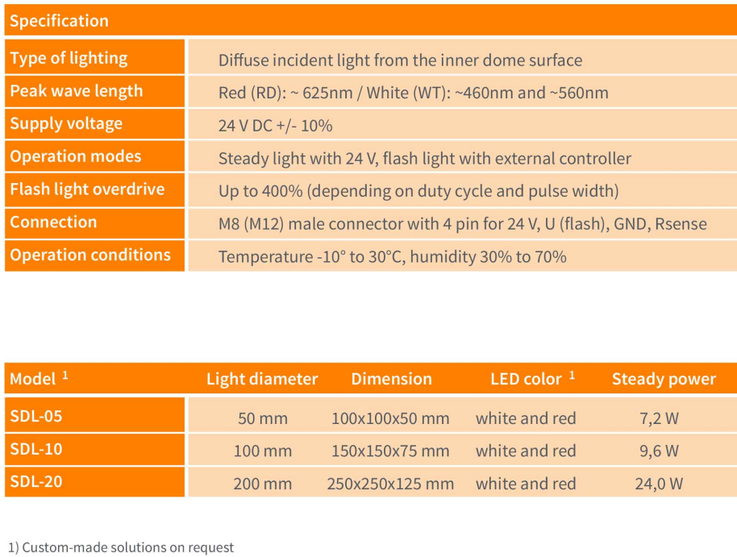 Designed as a flat dome and available with white, red as standard and blue or IR LEDs, the lighting is suitable for typical bright field applications. In combination with the optional cable, mounts and brackets compact camera sensors can be build-up in an easy way. 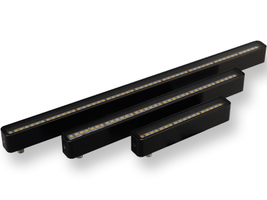 The BL-i Series are bar lights with integrated flash controller. The illumination is designed for the use in the flash mode. The flash is made with almost no delay by an high- or low-active trigger signals. The flash brightness can be adjusted with a build-in dimmer. 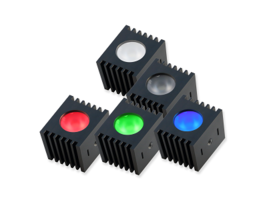 The lightings are available with white, red and optional in green, blue and IR LEDs. LEDs with a 4-die technology are in use. This makes it possible to generate powerful light spots in a compact housing. 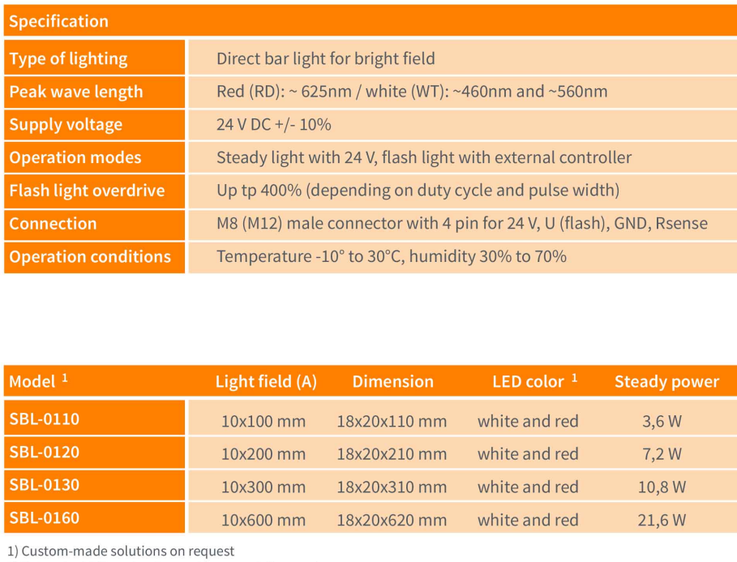 A new innovative LED controller allows flash and steady mode operation. For flash mode the light is automatically driven with 300% of the standard power for 20ms. 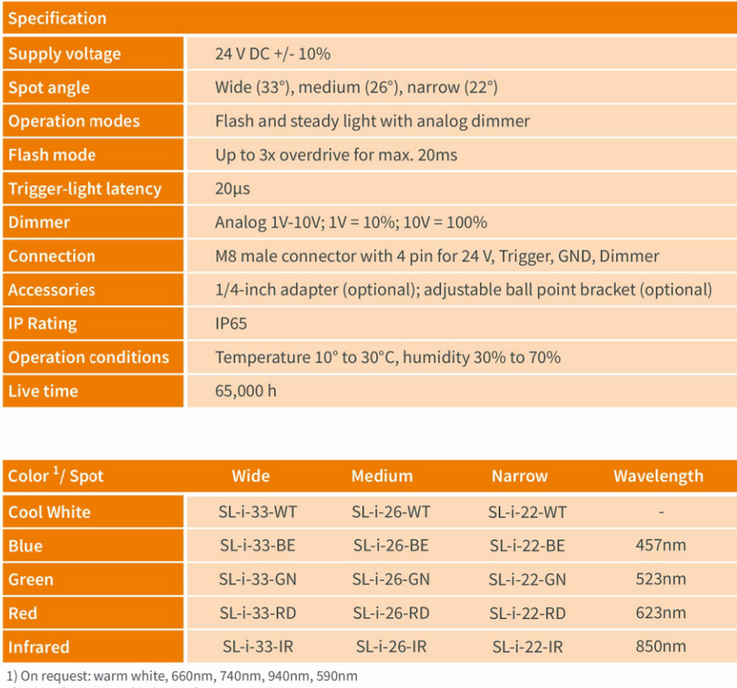 Using the 0-10 V interface the illumination is dimmable during steady light. The lighting is available with wide, medium or narrow spots and the LED color white, red, green, blue and infared. The IP65 protection class and the optional mounts makes the lighting ideal for use in a rough industrial enviroment. Typical application is an incident light for bright field use in a narrow space and a long distance to the object. 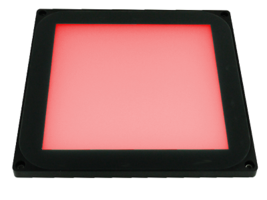 The CTR-5x LED controller are the perfect accessory for the control of LED lights in flash and continuous mode. There are two models as cap rail mounting version available. The CTR-50 is using a switching regulator for a precise ajustment and control of the current. The CTR-51 is using a linear regulator and capacitors which allows shortest flash and rise times of the LED lights. 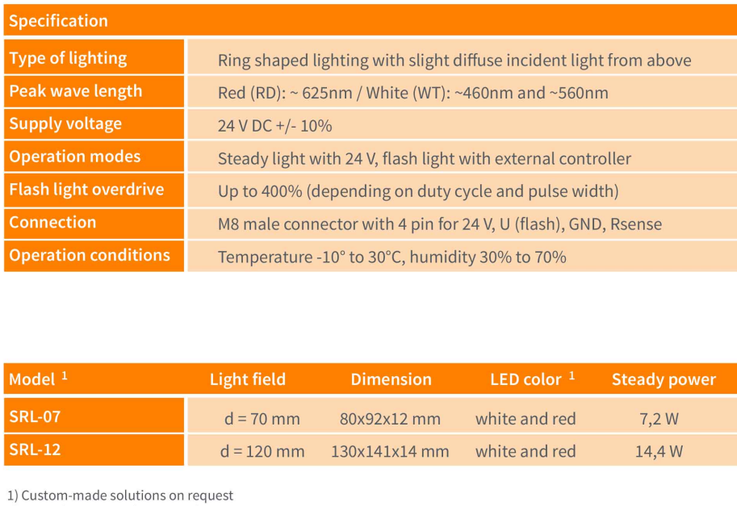 The advanced Rsense technology allows an automatic detection and save operation of all LED light modules. The cable are used to connect the LED lighting straight to 24V or the LED controller of the CTR series. Different length and connector types allow an easy electrical integration. Customised cables with connector for camera I/O are also available on demand. 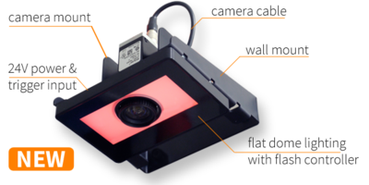 Without any additional construction work these camera and wall mounts allow an easy and fast mechanical integration of the camera and the lighting module into the application.